When were kaleidoscopes invented, and by whom? The beginning of the 19th century saw a marked increase in international sea travel, and a corresponding demand for effective lighthouses to see ships safely into harbour. In 1816, while conducting research into lengthening the distance lighthouse beams could travel, Scottish physicist Sir David Brewster noticed bright, colourful patterns being created when light refracted off of two mirrors. His discovery spelled the birth of the kaleidoscope, and within a matter of years, his invention was inspiring excitement and curiosity all around the world. By 1819, a mere three years after its invention, the kaleidoscope had already found its way across the waves to Edo period Japan, where records tell us how it captivated spellbound audiences in the city of Osaka. 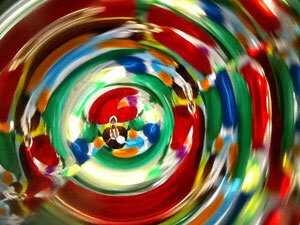 What was the very first kaleidoscope like? The world's very first kaleidoscope was the Brewster Scope (available for viewing in the Japan Kaleidoscope Museum). Created under Sir Brewster's guidance in an Edinburgh studio in 1820, it measures 17 by 3.5cm, and boasts a telescope-like body extendable by an extra 2cm. The words 'EDINBURGH, RUTHVEN' are etched into its viewfinder; removing it from its case reveals a ribbon inside emblazoned with a lion and unicorn, as well as the words ' Dr. Brewster's Patent '. Angled at 30 degrees to one another, the Brewster Scope's two mirrors create an image akin to a blooming flower split into twelve sections, as on a clock face. Its regular mirrors give rise to refraction, causing the image to appear slightly cloudy, while the convex lens of its viewfinder helpfully adjusts the focal length. From its very first incarnation, the kaleidoscope was already created with perfect scientific precision. The images created by its two mirrors bring to mind those of a church's stained glass windows, a sight familiar to Western users of the time. Where does the name 'kaleidoscope' come from? 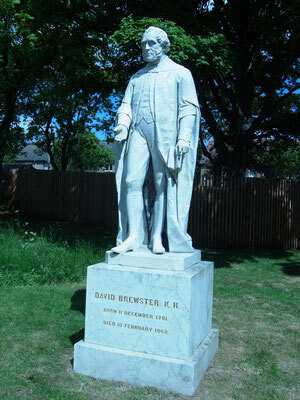 The name 'kaleidoscope' was yet another invention of Sir Brewster's. It originates from the combination of the Greek words kalos (meaning 'beautiful'), eidos ('shape') and scope ('to see'). In Japanese, kaleidoscopes were often referred to by comparison with various patterned fabrics, lending them poetic names such as 'calico spectacles' (sarasa megane) and 'brocade spectacles' (nishiki megane), as well as the rather more literal 'one hundred colour spectacles' (hyaku iro megane). The beginning of the 20th century saw a boom in the number of Chinese toys being imported into Japan. Among these was the kaleidoscope, referred to in Chinese as Wan Hua Tong (literally 'ten-thousand flower cylinder'). This name was then altered to the more familiar (to Japanese ears) Japanese pronunciation of mangekyô, which isstill in use today. Nevertheless, the Chinese-sounding root for the Japanese word for kaleidoscope still leads many Japanese to mistakenly assume that kaleidoscopes were originally a Chinese invention. Incidentally, the most popular and widespread of kaleidoscopes in Japan incorporated three mirrors in the shape of an equilateral triangle to create an image that appeared to spread out into infinity. Once there was a country called " Occupied Japan"
Sadly, the kaleidoscopes imported into Japan from China at the beginning of the 20th century were yet further casualties of the dreadful war that rocked the world during the 1930s and 40s. After the war ended, the toy industry in Japan was one of the first to spring back into action. Japan boasted a venerable tradition of household handcrafts, and toys of a wide variety were made swiftly (albeit in small quantities) using easily processed materials such as paper. One of the many toys to be made in this fashion was kaleidoscopes, which were soon being exported abroad in high numbers. As Japan was under the occupation of American forces at the time, however, kaleidoscopes produced and exported to the United States during the late 1940's bore not the inscription 'Made in Japan', but 'Made in Occupied Japan' instead. In standard mirrors (the type used in regular households, for example), the rear of the glass pane is covered in a layer of optical coating. A second pane of glass layered across the mirror's surface then serves to protect the mirror itself from scratches and smudging. However, as light refracts inside the glass, the image it produces upon reflection appears slightly cloudy to the eye. 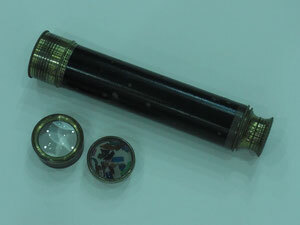 Most kaleidoscopes produced before 1980 incorporated this standard type of mirror, which explains why the image they produce appears slightly hazy. This haziness was first remedied by American kaleidoscope collector Cozy Baker, who initiated nothing short of a renaissance in kaleidoscope production by using 'first surface mirrors'––featuring a reflective surface on top of a backing, as opposed to behind––in place of the standard mirrors that had been used thus far. (First surface mirrors boast 100% reflectivity, and are used in astronomical telescopes to measure huge distances across the vast expanse of space.) 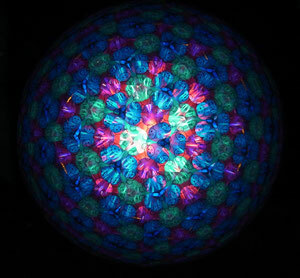 These new kaleidoscopes produced images far more beautiful than any seen before. 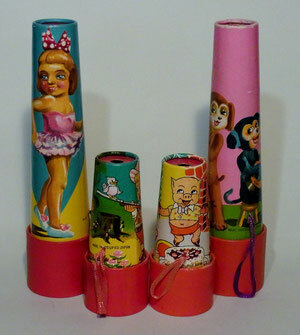 All at once, kaleidoscopes had made the transition from child's playthings into objects of art. 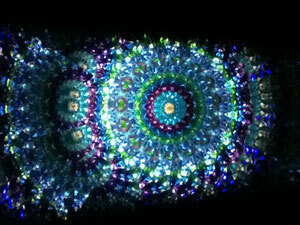 Learn about, look at, and create kaleidoscopes at the Japan Kaleidoscope Museum 462880899576?! The Japan Kaleidoscope Museum was initially established in a small flat in Tokyo's Shibuya ward in 1998. Japan's first museum dedicated to kaleidoscopes (and the most compact museum of any kind anywhere in the world), it was envisaged as a space where people could learn about and look at kaleidoscopes, as well as create their own. In September of 2012, it moved to its present location in Kawaguchi, Saitama prefecture, a 25-minute train ride from Tokyo station. Visitable by appointment only, the museum offers visitors two distinct courses: a viewing course (1000 yen per person) in which visitors are taken on a 40-minute guided tour through 200 years of kaleidoscope history; and a creation course, in which visitors get to experiment with various techniques to create their very own kaleidoscopes. (Kits come in beginner and advanced varieties, charged at 3000 and 7-9000 yen respectively.) Business hours are between 10am and 6pm, and the museum is without scheduled holidays. Which is just as well, really: viewing every possible permutation of image creatable with a kaleidoscope containing 20 different types of beads and three mirrors (and rotated at a rate of ten times per minute) would take approximately 462 billion 880 million 899 thousand 576 years––more than 10 times the age of the Earth itself! Originally born from science in the 19th century, kaleidoscopes incorporated front surface mirrors in the 1980s to stupendous effect, emerging as objects of art in the process. But what about kaleidoscopes in the 21st century? Kaleidoscopes being made nowadays often incorporate a wealth of artistic and creative ideas. 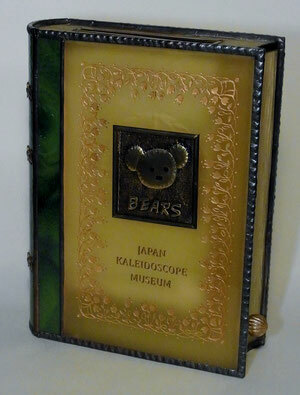 One example of this is the Japan Kaleidoscope Museum's very own Bears Scope series, which incorporates the bear-shaped logo of the museum's operating company, Bears Inc. Designed and produced to request by professional kaleidoscope craftsmen, each of these kaleidoscopes is a unique interpretation of illustrator Anzai Mizumaru's original bear design, and exist solely as one-off original pieces. Fusing science, art, and their creators' originality to fun and inventive effect, they are viewable––alongside other pieces spanning 200 years of kaleidoscope history––only at the Japan Kaleidoscope Museum.